So, the Christmas break is around the corner again and I have run out of time for buying myself a mandatory present. In response to that I have just purchased this 51mm/2 inch lift kit so I have something to do for the new year’s break. I have landed this via the net. It cost $245 NZD delivered to my door (about $185 USD). 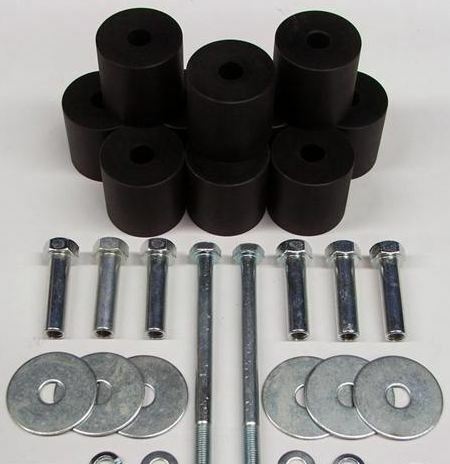 This bolt in, fully reversible body lift kit for your Suzuki can be easily fitted with basic hand tools. Great for making room to fit bigger tyres, or for that extra bit of height to improve the look of your Vitara. The reviews are positive all around and this is coming from people that have purchased and installed them. lefthandrides – If you want a body lift kit then buy it off this guy, excellent kit with excellent instructions. Great trade. You get the idea. Looking forwards to putting this in on the weekend, however have already identified an issue I’m going to have – the nudge bar is going to require new brackets to be machined.